Interesting stuff! Will definitely come back for part 2. If you plan on doing another survey in January 2018, it would be good to divvy up the fulltime vs parttime in ‘hours spent working’. Maybe with ranges? Of course, the amount of time writers spend on a book will vary hugely over a year, but it might be interesting additional data to have. Nice to know I fall pretty much in the middle. That is good news as an “indie” author. I’ll be looking forward to the rest of the results. May I share these results with friends? Thank you! Do you have a breakdown by genre planned? I’m also curious about number of books vs. income and how long people have been in the novel-writing business. Nice work! Have been following the survey since the beginning. Finally contributed to it this time after being in the US for the past three years. Look forward to the next part of the results. Thank you so much for sharing this data! Deborah K. Frontiera – Please feel free to share with friends and enemies alike. The more information we get out there, the better off we all are. Tara – I have some hours-spent-writing data, but I need to look through that to see how clean and usable it is. 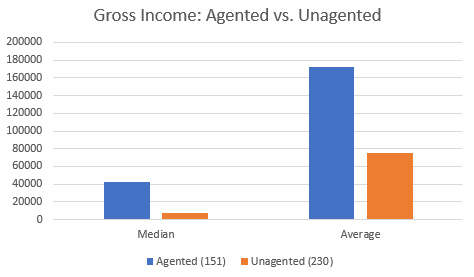 Hi, I’m sorry if this comes off as too critical, but your first graph (the percentile breakdown of 2016 novelist incomes) is misleading. When you glance at it, it makes it look like incomes rise in a linear fashion, which isn’t the case since the difference between each of the bars on the x-axis is not the same, which isn’t depicted visually. to understand what the graph is saying the viewer needs to read the entire x-axis number for number and interpret carefully or it looks like most people are making bank. I’m piping up to say something because when this link is shared on FB, that graph is the image that shows. So if you just switched your x and y axis’s variables then you would have more of a histogram (which is I think more what you intended? ), so it would show the distribution of incomes. Or if you wanted a cumulative histogram, I would recommend a line graph instead of a bar graph, since it’s more intuitive to understand that way. Hopefully this is helpful. Thank you for collecting this awesome and helpful information! I often find histograms more fully tell a picture than the percent under that income level (the name of the graph escapes me presently) as Fuuma commented previously. Also, are there plans to regress salary on the various attributes you surveyed (e.g., having an agent, writing full time, etc)? Hi! I’m unsure as to whether this is income from all sources or income from writing novels. Jim, thanks so much for doing this! It gives me hope that if I can get myself squared away and actually write, it may be possible to at least supplement the family income significantly. I’m far from it now, but…it’s something to strive for. I’m kind of bummed that I can’t see the graphs. You probably don’t want to overload readers here, but it would be really cool if you could also include it in table format in the final report. Again, many thanks for this incredibly valuable resource! Another comment about that first graph – it would be much more effective as a histogram with a logarithmic scale on the y-axis. Why didn’t you create a histogram of the data. 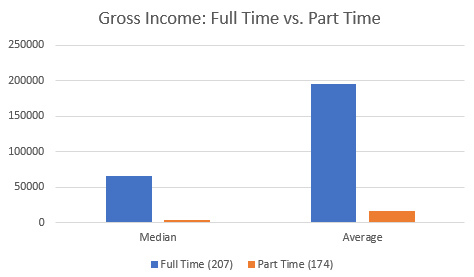 I would clearly show why there’s a massive disparity between average and median earnings. A cumulative histogram is also a better representation of graph #1. 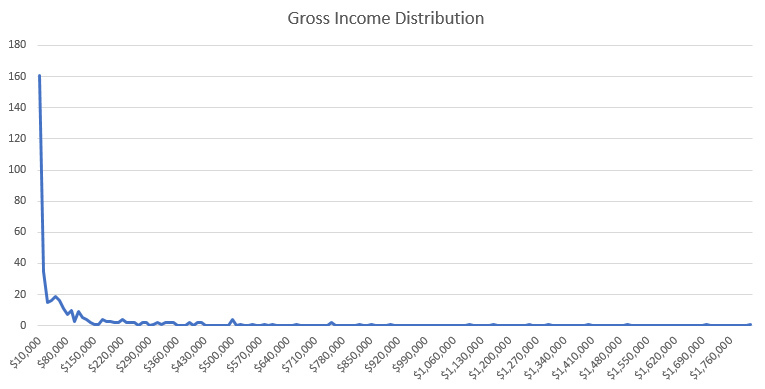 Far clearer to plot N($) number who made a given $ income vs. $ — the distribution function. I’ll be interested (but likely not surprised!) to see how gender correlates to income in your sample. Great stuff, Jim. Thanks for putting this together. I’d love to get my hands on the raw data (and I was a participant. Can you send it to me at michael.sullivan.dc@gmail.com? Thanks! ETA: And your wish is my command! I’ve updated the post with an additional graph. Something for me to keep in mind if I do this again next year. SherryH – My apologies. I’ll definitely include the tables in the final report, and will try to do better with those on the rest of the blog posts as well. As a data analyst (with an undergrad in math & stats and a graduate degree in analytics), but who has always loved reading (and has decided to start writing again soon..), reading this tickled every one of my fancies. I look forward to reading the next set of insights! And getting my paws on the raw data! I’d be especially interested in seeing how debut novelists are doing. Thanks for doing this project! Just thinking about this some more: important things to control for would be number of items published, as the income per book published is a bit more informative than comparing someone who has published 8 books to someone who has published just one. Which isn’t to say that the number of books published is directly related to income, but it seems worth controlling for. Additionally, it would also be interesting to compare length of being a published author (e.g., someone who first published in the 80’s to someone who published their first book in 2016). Side note, I remembered the name of the graph: cumulative percentage graph. 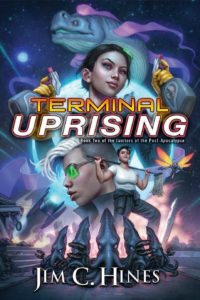 Sarah Avery – I asked authors when their first novel was published, so I should be able to separate out the debut novelists and compare/contrast there. Alexander Claxton – I’ve got both of those, and I agree completely. I’m trying to look at one variable at a time as much as possible. Jim, thanks for running this! Very useful data. If you run this survey again, I’d love to see breakdowns for race and gender, if folks feel comfortable supplying that info (and you felt comfortable asking for it). It’d be especially interesting to have that data paired up with particular publishers, but that’s probably outside your scope. What Do You Really Need to Be a Good Writer? – Do Not Hire This Editor.